Would you believe that I get the smallest AM spikes when I’m running late for work and end up picking up a Sausage McMuffin value meal (complete with hash brown) at McDonalds? Maybe the high fat content slows down the high carb absorption, or maybe it’s so toxic that it puts my liver-dump in “suspend” mode. It’s not a meal I particularly enjoy, but I’m always pleasantly surprised at the results. Most regular breakfasts give me a traditional gigantic spike, followed by a correction and then a low. My breakfast 95% of the time is an English muffin. I think it’s the high fiber flavor, but for sure I know it’s 100 calories and 25 carbs. I toast and add chunky peanut butter, which brings the total carb count to around 33-35. My trick is bolusing 10 minutes before I let the food touch my mouth. Also, my blood sugar needs to be below 120. If it’s over 120 and I eat carbs for breakfast I’m soaring into the high 200s within 30 minutes and no amount of insulin lowers me until at least 4 or 5 hours later. On days when I wake and I’m above 120 I scramble eggs, nuke turkey sausage or don’t eat breakfast at all. I feel ya on this post because I have the exact same questions and can’t really find any great options/variety for breakfast. Good luck. You know, I’ve noticed it makes a HUGE difference what my BG is at breakfast and also what direction it’s headed. Maybe I need an approach like yours where I only eat carbs if I’m in range and headed the right way. Something to consider. Thanks for commenting! I think it’s because McDonalds isn’t really food…. LOL!! And yes, I’m totally jealous of your post-breakfast flatline. I’ve also struggled with breakfast for a long time, which, I will admit was because I would grab a Tim Horton’s muffin on my way to the bus. I kept telling myself that with all this fancy pumping and extended boluses it should be possible, but unfortunately it wasn’t. I know you said you weren’t keen on eggs, but my answer was a hard boiled egg and a full avocado (ya, I just eat it with a spoon…). 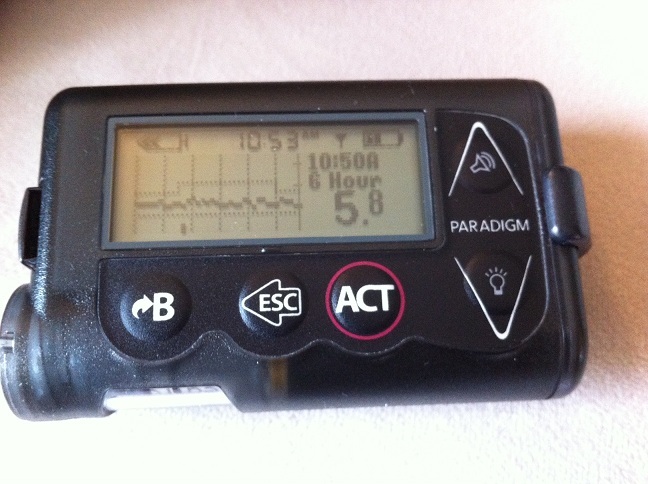 I love it because with no bolus it keeps me perfectly stable (just a tiny rise in BG) and I can still pack it easily. Amazingly, it actually keeps me full until lunch time too! Thanks Courtney. I actually love eggs, but I’m afraid if I eat them every day I won’t love them anymore. I like having them as a lunch option. I really enjoy avocados too – even with a spoon. I’m starting to lean more towards finding some sort of no-carb breakfast options. Thanks for the suggestions! I’m late to the thread but I only just discovered your awesome blog!!! I usually have a smoothie for breakfast – it’s quick and light and I can take it with me if I’m running late. 1/2 cup frozen berries, scoop of whey powder (Jay Rob has only 1gram of carb per serving), almond milk. Optional extras: handful of spinach leaves, tablespoon of almond butter. Total carbs = 12-15, depending on your serving size.